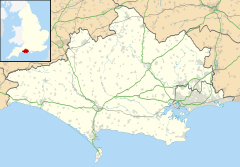 Fontmell Magna is a village and civil parish in north Dorset, England. It is situated in the Blackmore Vale, close to the chalk hills of Cranborne Chase, on the A350 road 5 miles (8 km) south of Shaftesbury and 8 miles (13 km) north of Blandford Forum. In the 2011 census the parish had a population of 734. The name Fontmell derives from a Celtic river-name meaning 'spring by the bare hill', and Magna—meaning great—distinguishes this settlement from Fontmell Parva (parva meaning small), which is a few miles southwest in Child Okeford parish. In 877 Fontmell Magna was recorded as Funtemel, in 1086 in the Domesday Book it was Fontemale, and in 1391 it was Magnam Funtemell. Evidence of early human presence occurs in the east and northeast of the parish in the form of earthworks on the chalk hills: these consist of three cross-dykes, a barrow and a mound that is also possibly a barrow. In 932, King Æthelstan granted an estate at Fontmell to the nuns of Shaftesbury Abbey under the condition that they would sing 50 psalms after Prime and offer masses at Terce, for the king's intention. Of settlements existing within the parish today, the earliest is the main village, which originated before the Norman Conquest. The Domesday Book of 1086 recorded that Fontemale was in Sixpenny Hundred; it had 3 mills, 68 households, and the estate's lord and tenant-in-chief was Shaftesbury Abbey. A land survey made by the abbey in about 1130–35 shows that the Fontmell Magna estate had 65 tenants, of whom 41 were villeins, each holding between half and one yardland, and the rest were cottagers, each with about four acres. The number of mills had increased to four. A second survey made in about 1170–80 shows the population had increased to 80 tenants, of whom 55 were villeins. To the west of the main village, the hamlet of Bedchester is also of pre-Conquest origin, though the settlement furthest west in the parish, Hartgrove, wasn't recorded before 1254. Hill Farm, over the chalk hills in the east of the parish, first appears in records in 1333. Fontmell Magna is in The Beacon electoral ward, which extends to Cann in the north, Sutton Waldron in the south and Guy's Marsh in the west. The ward, which had a population of 2,277 in the 2011 census, is part of the constituency of North Dorset, and is currently represented in the UK parliament by the Conservative Simon Hoare. The parish covers 3,200 acres (1,300 ha) and extends from the dip slope of Cranborne Chase in the east, to the area around the settlement of Hartgrove in the Blackmore Vale in the west. From west to east the underlying geology comprises Kimmeridge clay around Hartgrove, a ridge of Lower Greensand east of the Twyford Brook, Gault and Upper Greensand from the valley of the Fontmell Brook eastwards, and then the high chalk escarpment of Cranborne Chase. The chalk hill just outside the village to the east, Fontmell Down, is a nature reserve. The Met Office has a climate station at Fontmell Magna. Between 1981 and 2010 it recorded an average of 857.3 millimetres (33.75 in) of rain per annum, and average temperatures between 1.6 and 7.8 °C (34.9 and 46.0 °F) in January, and 11.4 and 21.7 °C (52.5 and 71.1 °F) in July. In the 2011 census Fontmell Magna civil parish had 334 dwellings, 319 households and a population of 734. There are 45 structures within Fontmell Magna civil parish that have been listed by Historic England for their architectural or historical interest. There are no structures listed as Grade I – the designation of highest significance – but the parish church is designated as Grade II*. All the other listings are Grade II. In 1906 Sir Frederick Treves described the church as "one of the handsomest in Dorsetshire". Lieutenant Philip Salkeld V.C., who was awarded the Victoria Cross for his role in blowing open the Kashmir Gate in Delhi, India, in 1857, was born and grew up in Fontmell Magna, where his father was the rector. The village is also the birthplace of the orchestral conductor Sir John Eliot Gardiner CBE FKC. In the last 20 years of his life the village was home to cinematographer Oswald Morris. ^ a b c "Area: Fontmell Magna (Parish), Key Figures for 2011 Census: Key Statistics". Neighbourhood Statistics. Office for National Statistics. Retrieved 21 July 2014. ^ a b David Mills, ed. (2011). A Dictionary of British Place Names. Oxford University Press. p. 192. ISBN 978-0-19-960908-6. ^ a b c d e "'Fontmell Magna', An Inventory of the Historical Monuments in Dorset, Volume 4: North (1972), pp. 21–27". British History Online. University of London & History of Parliament Trust. November 2013. Retrieved 23 July 2014. ^ a b "Place: Fontmell [Magna]". Open Domesday. domesdaymap.co.uk. Retrieved 23 July 2014. ^ "Dorset A–G". The Domesday Book Online. domesdaybook.co.uk. Retrieved 22 July 2014. ^ a b Bettey, J.H. (1974). Dorset. City and County Histories. David & Charles. pp. 42–3. ISBN 0-7153-6371-9. ^ "The Beacon ward 2011". Retrieved 1 March 2015. ^ "Dorset North Parliamentary constituency". Election 2015. BBC. Retrieved 10 May 2015. ^ Booton, Peter (April 2012). "Melbury Hill, Compton Abbas and Fontmell Down". Dorset Life. Retrieved 26 July 2014. ^ "Fontmell Magna climate". metoffice.gov.uk. Met Office. Retrieved 19 July 2016. ^ "Area: Fontmell Magna (Parish), Dwellings, Household Spaces and Accommodation Type, 2011 (KS401EW)". Neighbourhood Statistics. Office for National Statistics. Retrieved 27 July 2014. ^ "Parishes (A-L), 1921-2001- Census Years". Dorset County Council. 27 May 2014. Retrieved 27 July 2014. ^ "Listed Buildings in Fontmell Magna, Dorset, England". britishlistedbuildings.co.uk. Retrieved 5 April 2016. ^ Treves, Frederick, Sir (1906). Highways and Byways in Dorset (1st ed.). Macmillan. p. 50. ^ "Lieutenant Philip Salkeld V.C." dorset-ancestors.com. 26 May 2013. Retrieved 26 July 2014. This page was last edited on 21 June 2018, at 09:21 (UTC).